Leroy Merlin offers you easy-to-use software that allows you to virtually design your bathroom. Practical, this software will allow you to visualize your furniture for your future bathroom. The proposed interface is intuitive and gives you access to an assistant to help you at each step. All you have to do is create your bathroom in 3D by adding the dimensions, then add showers, baths, furniture and other elements offered in a selection of products available in store. The software will be particularly useful to manage your budget as it will give you an idea of the amount of your future purchases. Completely free, 3D Architecture special 2D Plan is a software dedicated to the creation of all your real estate plans. Draw with your mouse on the slate space that is located in one of the windows of your operating system with the slate software. 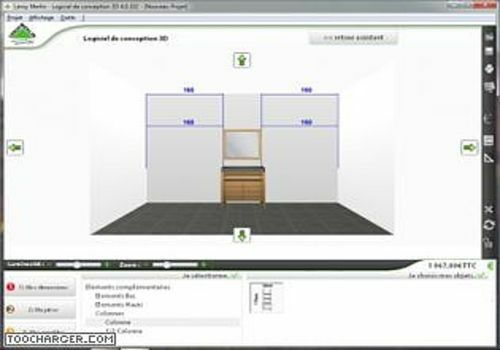 Transform yourself into an interior designer with pCon Planner, which is a very serious free alternative to the best paid architecture software.